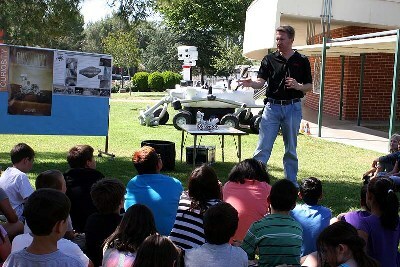 Dennis Young shows the students one of the Mars rover's wheels. JPL scientists visited SCE to wow the kids with presentations, videos and interactive demonstrations of the National Aeronautics and Space Administration’s latest mission to the fourth rock from the sun. 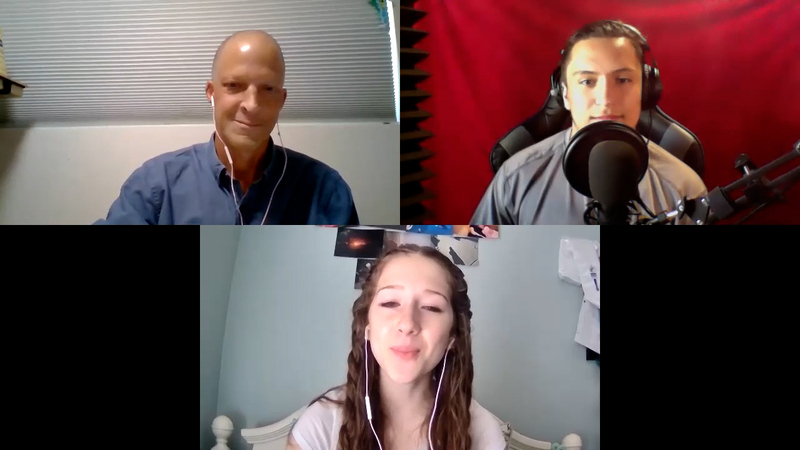 “NASA and JPL in particular have something called the Education and Public Outreach Office,” said Dennis Young, JPL’s lead resource analyst for the Mars Science Laboratory, and coordinator of the day’s activities. Young and a few fellow JPL engineers displayed a full-scale inflatable model of the actual Mars rover, and delivered a 25-minute presentation about the current Mars mission, which included a short video to bring the students up to date on the latest data and images received from the Lab on the Red Planet. 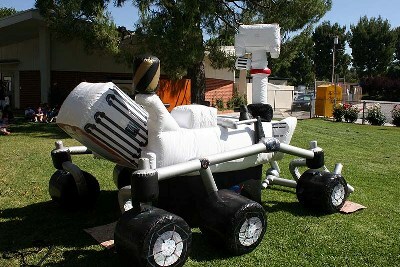 The Humvee-sized inflatable Mars Rover model landed on the front lawn at Santa Clarita Elementary. Young’s ulterior motive is entirely positive and shared by Dianne Saunders, Santa Clarita Elementary’s principal, Kathi Lund, the school’s Library Media Specialist and assistant to the GATE (gifted and talented education) program, and all the teachers on the staff. Young said elementary school is just the place to start that re-association of science and cool. “You’ve got to plant the seeds at grade school and junior high school-level, before they get that idea that this is geeky, this is not cool,” he said. 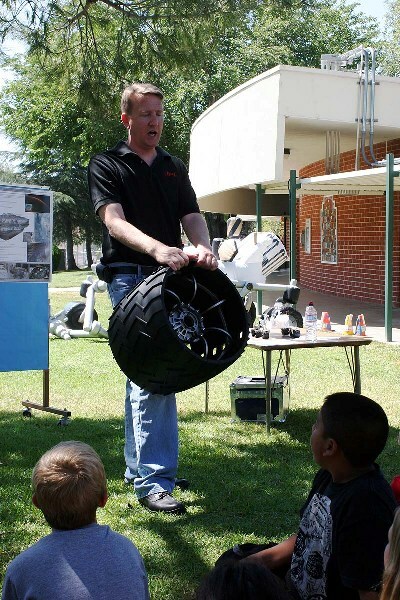 A “JPL Day” highlight for the students was a wheels-on demonstration of a smaller working model of the rover’s chassis, nicknamed Sammy. JPL engineer Fabien Nicaise lined up rows of kids on the floor of the school’s multi-purpose room and drove the electrically powered model over their backs, demonstrating how the real rover’s independently controlled wheels can easily roll over rocks and other obstacles on the Martian surface. Students were also issued special glasses so they could view a huge 8′ x 25′ banner of a 3-D photo of Mars taped to the wall behind the MPR stage. Nearby in the school’s Science Lab, another JPL scientist, Nathaniel Alderson, introduced the students to the Deep Space Network and talked about the special challenges of communicating with spacecraft as they travel to the outskirts of our solar system. “I’m explaining to them how the spacecraft, from so far away at the different planets, are able to communicate back to Earth without using much power, and how we’re able to, with very sensitive equipment, hear the signal and decode it so we can get all the pictures and data from the science instruments,” Alderson said. “It’s fun because you learn about all the different planets and maybe things that you don’t learn in your regular science (class),” said fifth-grader Tiffany Solis. Tyler Barton, also in fourth grade, wants to be a geologist, and likes science “because you get to learn about the planets,” he said. Maybe someday he’ll explore rocks from Mars. Cusack added that “it would be cool to go to Mars, but I also think it would be scary at the same time.” What does he think he’d find there? “Rocks, and maybe some ice,” he said. “I liked learning how the Mars rovers work, and every bit of it is amazing,” said Jesse Kelley, also in fourth grade, when asked what he liked best about the day. He wants to be a marine biologist. “JPL Day” dovetails perfectly with Santa Clarita Elementary’s effort to develop partnerships with various outreach departments at JPL to connect the students directly to scientists and engineers in various fields. “Visits from JPL techs who make science come alive are investments in the next generation of problem-solvers and space travellers,” said Dianne Saunders, SCE’s principal, who is dedicated to highlighting science in the Saugus Union School District school’s curriculum across all grade levels. “Santa Clarita’s working toward being a science-space school, so each year we do something different in the area of science,” Saunders said. 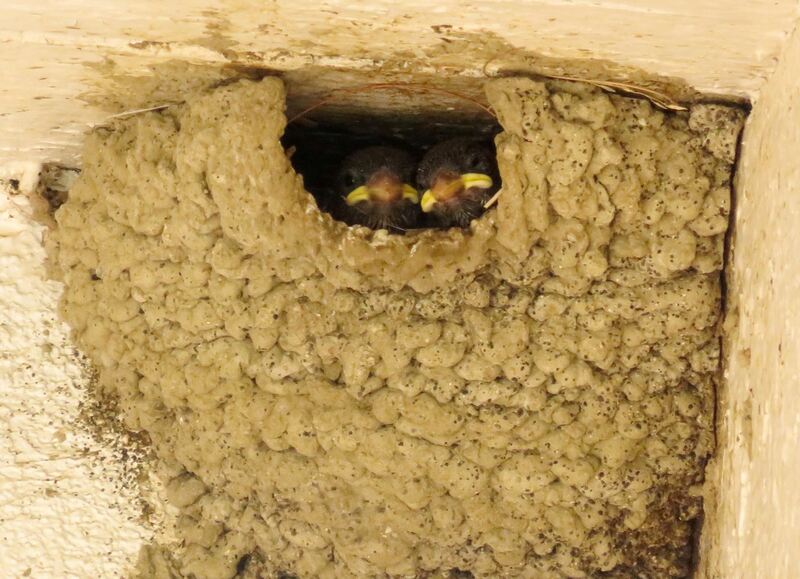 “This year we had a huge environmental project. We’re fortunate and excited to have this partnership with JPL. As a member of the JPL team, Dennis Young began the program here last year. We worked with them, mostly with our third- and fifth-graders, I believe, and this year we have brought it to the whole school. The once-dominant United States ranks fourth in the world in awarding undergraduate engineering degrees, according to a 2008 study from Engineering Trends. 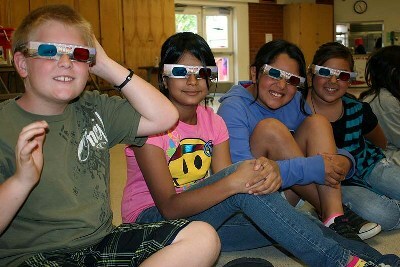 Santa Clarita Elementary is among the growing list of schools redoubling efforts to turn out future scientists, engineers and mathematicians who will, educators hope, put the United States back on top as leaders in pioneering science, rather than continuing to concede that status to other countries that put greater emphasis on math and science education. “We are preparing the next generation,” Saunders said. “There’s been a real push in education for what’s called STEM — science, technology, engineering and mathematics, so we’ve taken the science component of that. We don’t have enough money to do the technology component. We do have technology in all of our classrooms, but of course not as much as we’d like. But we are able to do a lot with science. How effective is “JPL Day” in getting her students excited about such careers, really?